Udo-Gabriel has come a long way since being discovered at Making of Champions’ Top Sprinter Auditions held in Benin in 2015, to becoming a Commonwealth Games Bronze medallist in the women’s 4x100m in 2018. The 17-year old picked an interest in Athletics from her childhood and has won several medals at both State and National levels as a secondary school athlete, winning Silver in the 100m, and GOLD in the 4x100m at the 2014 National Schools Sports Festival (NSSF) in Benue State. In 2015, she was crowned the fastest school girl in Lagos State after stopping the clock at 12.91s to take the win ahead of tournament favourite, Ruth Usoro at the Lagos State Secondary School Sports Festival. At the Benin Auditions in September that year, she won her race in 12.5s, before going on to finish 4th at the Lagos Finals in October, achieving all of these with minimal training. 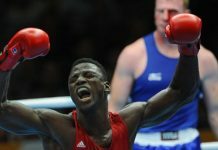 Udo-Gabriel came under the tutelage of Nigerian Olympic medallist Deji Aliu in November 2015, and has made rapid improvement since then. Her first competition as an MoC athlete was at the 2016 National Junior Championships where she won her heat. She made her debut outing at the AFN Golden League in Sagamu where she ran a then Personal Best (PB) of 12.06s. 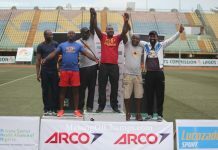 She lowered her PB to 11.87s to win the women’s ‘B Final’ at the Akure Golden League, finishing ahead of her more established rivals. This earned her a spot at the Nigerian Trials where she placed 7th in Heat 3 in 11.88s. Her impressive form saw her become a beneficiary of MoC’s Student-Athlete scholarship where she is currently being sponsored by Oil and Gas company, ARCO Group ahead of the Tokyo 2020 Olympics. At the Athletics Federation of Nigeria (AFN) / Dynamic Sporting Solutions Track and Field Meet held in Abuja in June 2017, Udo-Gabriel stormed to victory in her heat in a PB of 11.65s, before setting a PB of 24.26s in the 200m to qualify for the African Junior Championships in both events. 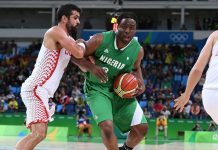 Unfortunately, Nigeria did not send a team to the competition. 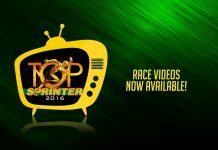 The teenager went on to win Silver in the 100m/200m at the AFN/MoC National U-20 Championships later that month. 2018 proved to be a turning point in Udo-Gabriel’s career as she finished 3rd in the women’s 100m at the Commonwealth Games Trials held in February in Abuja, to make the Nigerian team for the Commonwealth Games in Australia. She made her international debut for Nigeria in Gold Coast where she smashed her PB to 11.42s while competing in the 100m, before setting a time of 11.53s in the semis where she placed 4th, narrowly missing a place in the final. 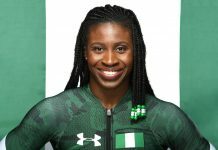 However, she bounced back in the women’s 4x100m relay where she ran the first leg and partnered with African Record holder in 200m Blessing Okagbare-Ighoteguonor, Tobi Amusan and Rosemary Chukwuma, to win Bronze behind England and Jamaica with a time of 42.75s. Following her impressive feat at the Commonwealth Games, Udo-Gabriel’s sponsor ARCO Group, announced an extension of her Scholarship until 2022. ARCO Group sponsors 2 athletes in MoC Student-Athlete Scholarship! 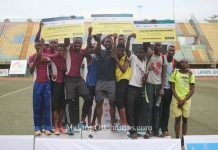 2015 Top Sprinter Auditions reach climax in Benin! 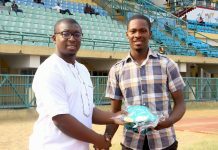 MoC’s Udo-Gabriel places 2nd in 100m Final behind Isoken Igbinosun at the 2017 AFN Meet in Abuja!